Republicans have floated the idea that Senate Minority Leader Chuck Schumer orchestrated the monthlong scandal surrounding sexual misconduct allegations against then-Supreme Court nominee Brett Kavanaugh. Republicans have also called for an investigation into how Dr. Christine Blasey Ford’s initial letter detailing the allegations was leaked. Senate Judiciary Committee Chairman Chuck Grassley has not made up his mind on whether to probe the leak of the letter. 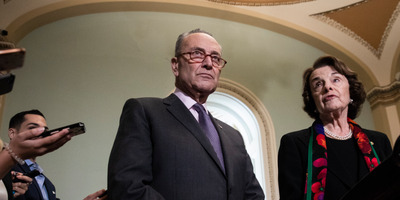 WASHINGTON – Republicans in recent days have begun suggesting that Senate Minority Leader Chuck Schumer orchestrated the entire scandal that played out over September during the controversial confirmation of newly minted Supreme Court Justice Brett Kavanaugh. On Tuesday and Wednesday, during interviews with conservative talk radio host Hugh Hewitt, Republicans floated the idea that Dr. Christine Blasey Ford, the woman who came forward with allegations of sexual assault against Kavanaugh, had been handled by Schumer in an attempt to derail the nomination during its final stretch. “So I strongly suspect that Chuck Schumer’s political operation knew about Ms. Ford’s allegations as far back as July and manipulated the process all along to include taking advantage of Ms. Ford’s confidences and directing her towards left-wing lawyers,” Cotton added. Cotton’s claim earned the dreaded “four Pinocchio’s” from the Washington Post fact-checker. The Post cited the fact that McLean never worked for Bharara, despite Cotton’s insistence. Matt House, a spokesman for Schumer, called the theory a “fairy tale” and likened it to Cotton’s recollection of President Donald Trump referring to certain African nations as “shithole” countries. But on Wednesday, after the Post fact checkers debunked Cotton’s claim, Hewitt continued to run with it anyway, asking about it to Utah Sen. Mike Lee, a Republican on the Senate Judiciary Committee. A handful of Republicans, including Cotton, have called for investigations into the handling of Ford’s initial letter and how it leaked to the press after Kavanaugh’s first confirmation hearing. On Tuesday, Senate Judiciary Chairman Chuck Grassley told reporters he had not yet made up his mind as to whether he would probe the handling of Ford’s letter.